The Water Quality Association universally called WQA, is an international trade association representing the residential, commercial and industrial water treatment industry. WQA is a non profit Association which works for the betterment of the water treatment industry by looking after the concerns of consumers, government departments, manufacturers and traders in the water treatment Industry. WQA is also an American National Standards Institute (ANSI)-accredited certification body like NSF International, Underwriters Laboratories - UL, etc. 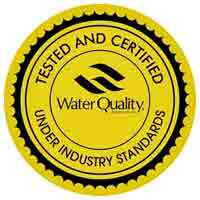 WQA can certify any product that comes into contact with drinking water, like pipes, fittings, faucets, water filters and water purifiers. Internationally the NSF/ANSI 60 or NSF/ANSI 61 standards are recognised as one of the most stringent standards for any equipment for use with drinking water. The World Health Organisation WHO accepts NSF/ANSI 60 or NSF/ANSI 61 certification issued from an ANSI accredited certification body like WQA. The Water Quality Association’s Gold Seal Product Certification Program is a unique testing and certification program that tests rigorously the quality of a product from all aspects like delivering promised benefits, longevity of the product and its working life, aesthetics, etc. The WQA Gold Seal has been a ‘Mark of Excellence’ since 1959. Once a product has passed the testing in WQA's most upto date sophisticated laboratories, then it can display the WQA Gold Seal as shown on the right. Products that display the Water Quality Association’s Gold Seal provide assurance to consumers that these certified products have been rigorously tested and meet the requirements of the NSF/ANSI standards. NSF or the National Sanitation foundation with their website www.NSF.org (should not be confused with the National Science Foundation with the website www.NSF.gov) was formed in 1944 as an independent, not-for-profit organization with the aim of making the world a safer place for consumers. Testing and certification of water purifiers by these prestigious institutions of WQA and NSF is good for consumers of water purifiers, because we can be sure that the certified products that we are buying will actually work as claimed by the manufacturers. It is not easy for us consumers to know whether or not a particular water purifier will actually work and be as safe and effective as the manufacturer claims at reducing various contaminants from the water supply.